After considerable debate, it was decided that the group would split for the day’s activities. Keith and I decided to go to Launceston town and it’s surrounds. It was the right decision! The girls gave us a lift to town and we visited the tourist information centre who provided a map and hot tips on what to see. First up it was the park after a little retail therapy for me ( well, it is going to be colder on Cradle Mountain than anticipated……). 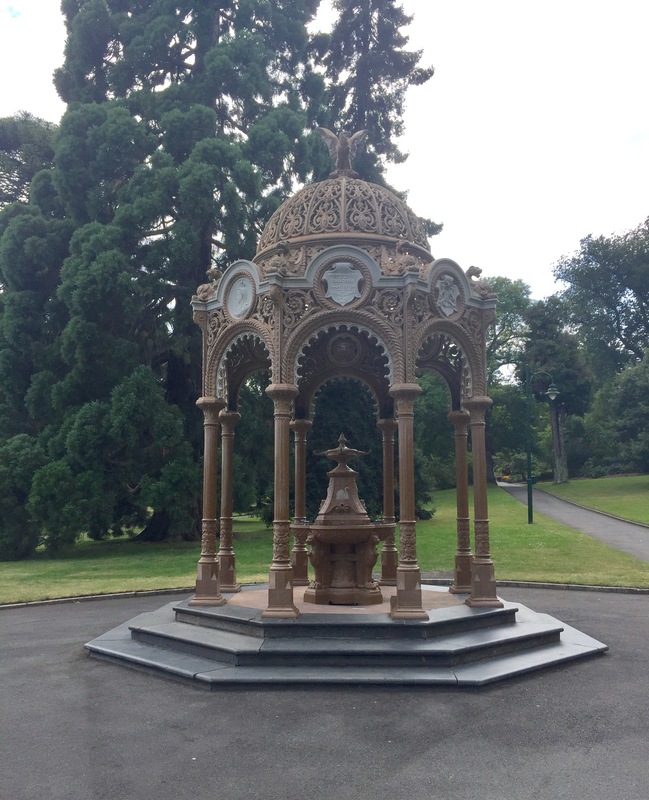 It had a very Victorian feel with a children’s fountain and bronze statues. 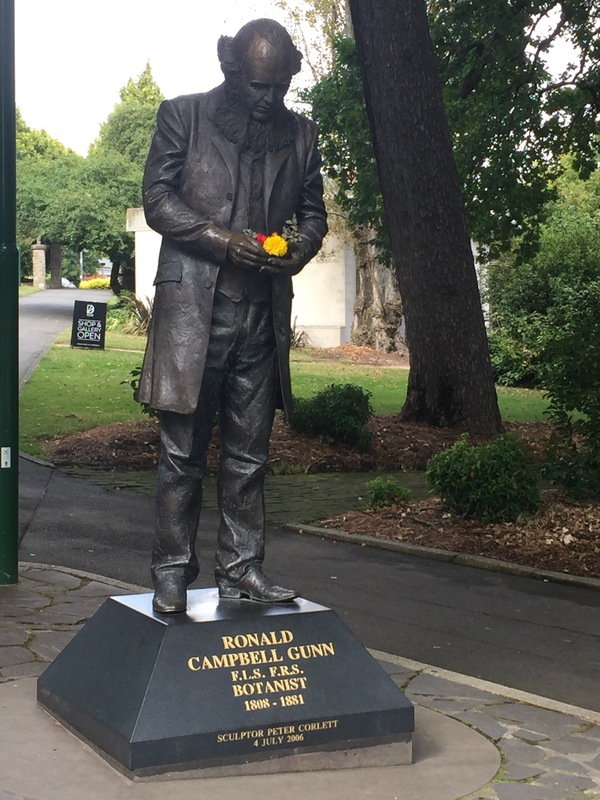 We particularly liked the statue of a chap called Ronald Campbell Gunn, a self taught botanist, who introduced Tasmania’s natural history to the world it is said. It was a wonderful sculpture From here we walked down to the river towards the wharf. We passed the Boag Brewery, founded in 1831. It is still going, but now has a modern extension. Launceston was obviously a very wealthy town. It was rich in minerals, shipped grain and milled flour to England and Australia and ships could get from the coast down the Tamar River to the town. This wealth was reflected in the Customs House which stood proudly overlooking the River. 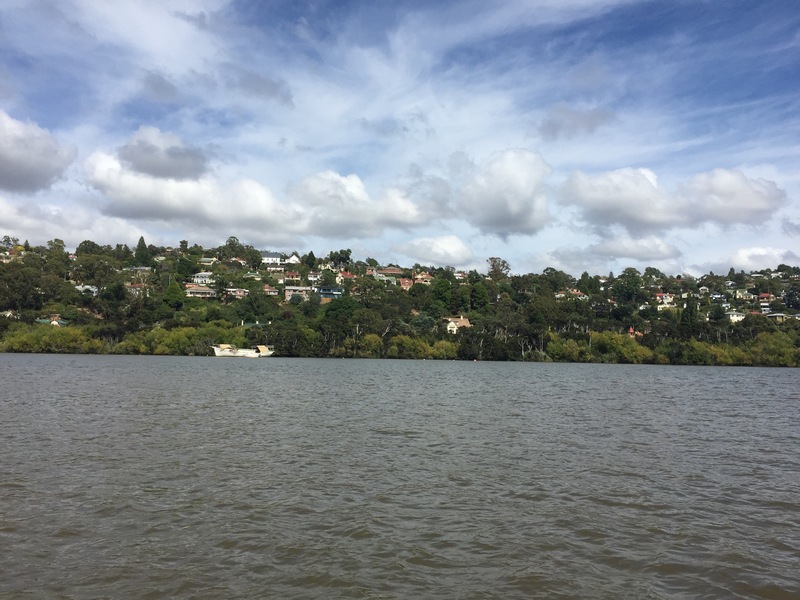 We wandered on towards the the dock and eventually came to the jetty where we could join a short boat trip and so boarded the Lady Launceston, a small pleasure boat captained by the wonderful Geoff. There were only 12 of us on the trip – but we learnt so much! We set off from the wharf, recently renamed the Seaport. Three rivers join at Launceston. The north and south river Esk which come together at the point they meet the Tamar. The Tamar flows out into the sea at Strahan on the north coast of the island. (Please consult your maps!) 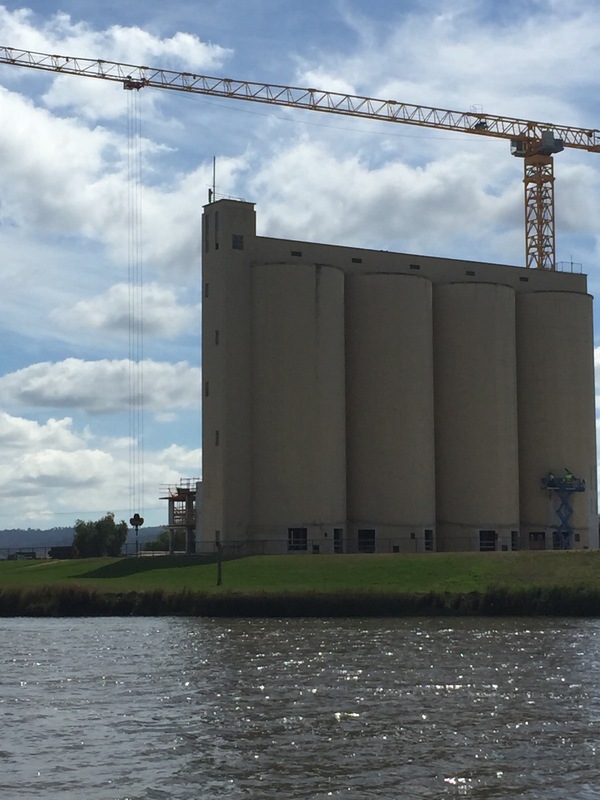 It is this facility to accommodate shipping travelling right into the heartland of the island that made Launceston such a success, as it meant that ships could reach the source of grain, beer and the minerals and take it to the Australian mainland and elsewhere. 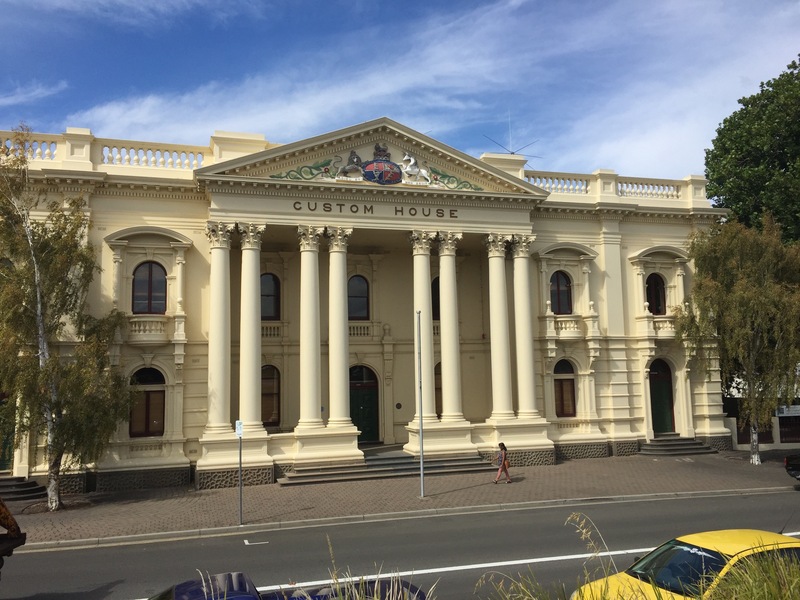 In early days Launceston supplied the large numbers involved in the gold rush. 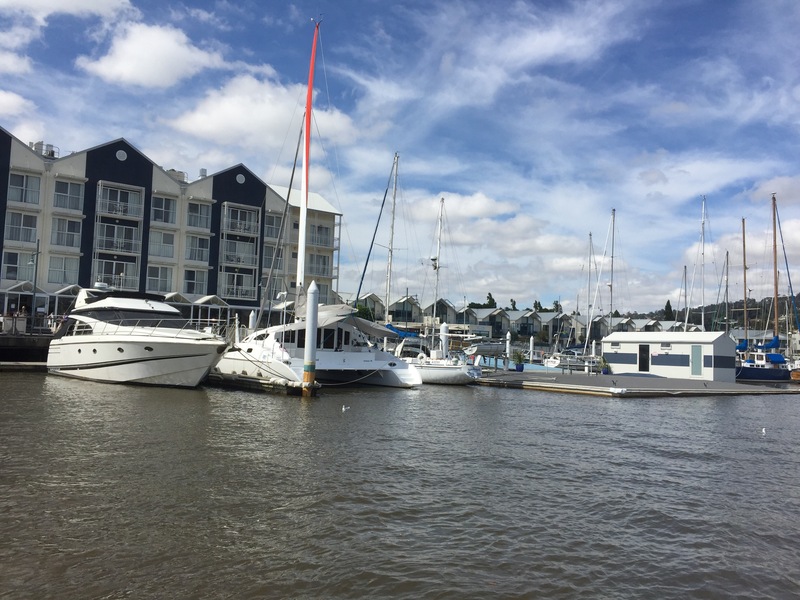 At 70 Kms the Tamar is Australia’s longest waterway. As we meandered around the harbour, young Geoff supplied all sorts of facts and figures about Launceston. Around us exotic quayside apartments and houses came into view contrasting with something of a graveyard of shabby shipping, including an old Hong Kong ferry (somewhat off course!). Houses covered the steep hillside overlooked the river, many of them quite old. Apparently wood lasts very well in the climate of Launceston as there are no white ants, the arch enemy of old houses in Australia. Building on the hillside became possible once the Kings Bridge had been built across the entrance to the gorge. It is certainly a very smart bridge, a prime example of Victorian engineering. The bridge was more impressive than the thought of the current plan to make the old grain silos into hotel – I hope they put a few more windows in! We passed under the bridge and continued up the gorge to the sound of – we could not believe it – the bagpipes again! There, high above us, stood a small building housing a lone piper! We are obviously particularly blessed! At this point the boat turned around and our boat trip ended. Deciding to investigate the gorge further, we walked across the bridge and took the pathway along the gorge’s cliff edge. 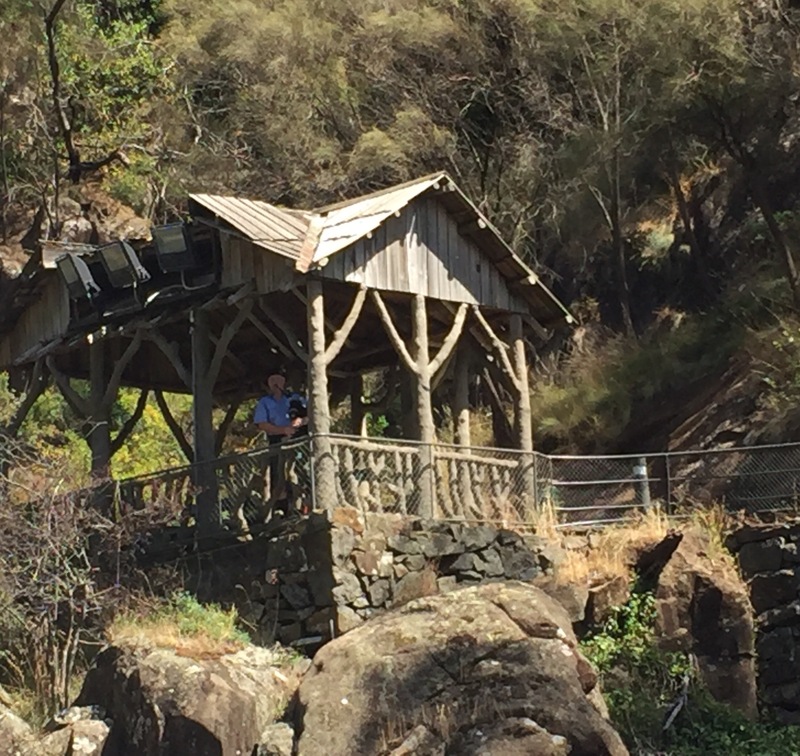 As the water of the gorge got shallower, it gushed over rocks until it eventually ended at yet another Victorian delight – the gardens! A whole swamp area had been drained and laid out as a Victorian promenade – complete with bandstand and peacocks! It was here that we met up with our chums again – not planned but very pleasing. After an abortive attempt to have lunch (one lacklustre waitress was not going to feed us before nightfall we thought!) we abandon the attempt and decided to go to the races! 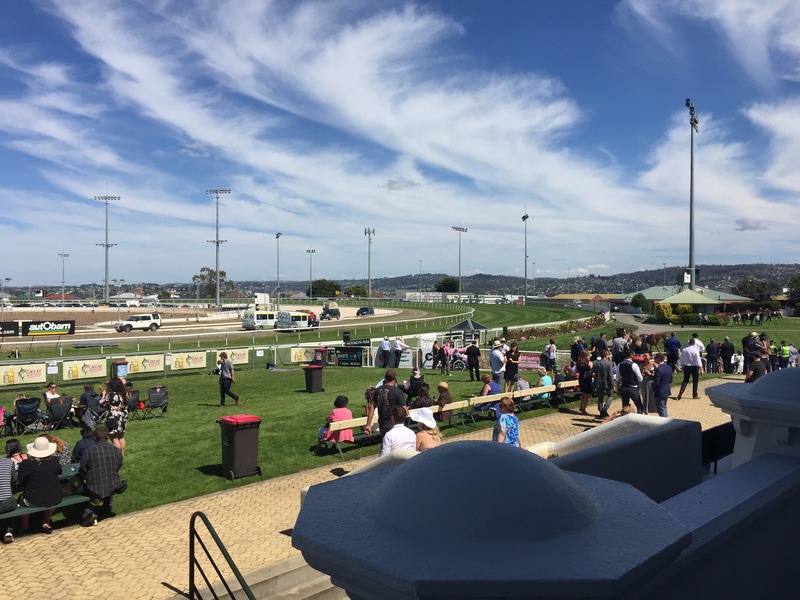 We had arrived on the day of the Launceston Cup – an event that closes many of the shops and restaurants of the town and is obviously a very high spot in the Launceston social calendar. Wendy and Sarah declined, but a very under dressed trio (as it turned out) of Keith, Helen and I set out. It was great fun! We arrived at the race track to find an event that would not have shamed Royal Ascot! Amazingly attired ladies strutted about on incredibly high heels ( did they not know that grass would be involved?!) with fantastic hats and wonderful designer dresses. The men were on the whole less formally attired – in fact I came across a new concept – men with bow ties and braces wearing shorts! Interesting. 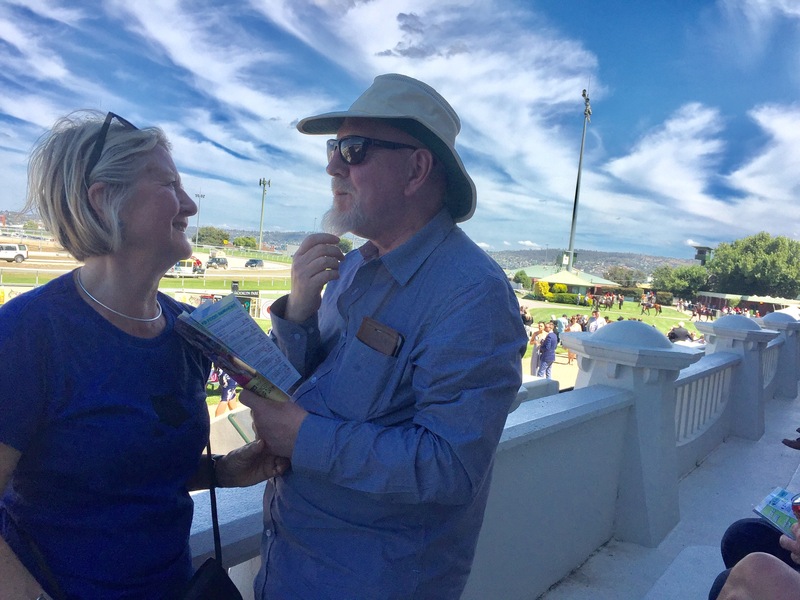 It was a fashion parade of the first order and I felt somewhat conscious of the walking sandals, shorts and t shirted figure that was me, but undaunted we bought a glass of champagne, placed a couple of bets and took a seat in the stand overlooking the winning post – and my horse won!!!! I have to acknowledge that Keith had identified the horse (I think his knowledge comes from a misspent youth!!) and showed me how to do it…… I have to report getting quite excited as Pateena Arena crossed the line! I won the whole of 27 Aus dollars. 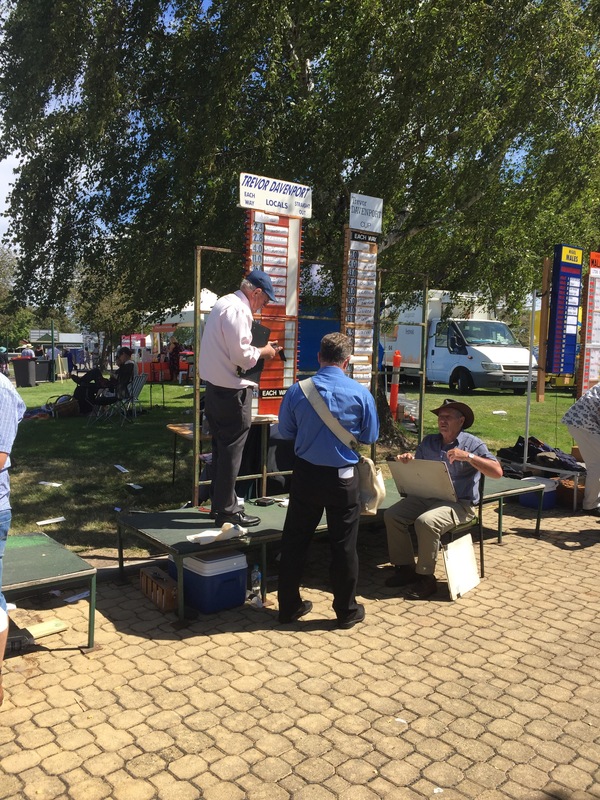 I don’t think it will be a large part of my retirement and I think Lingfield will not form a large part of my future….. 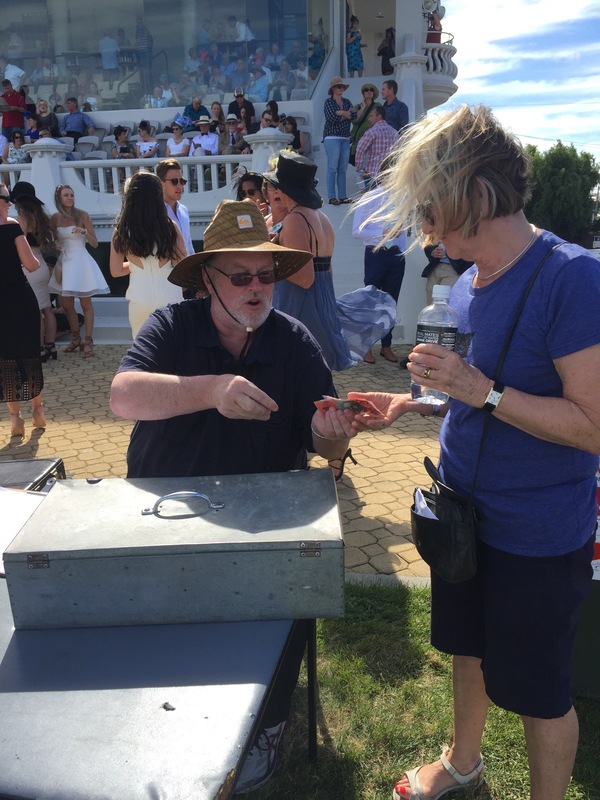 I do think the bookie was somewhat surprised when the paparazzi of Helen and Keith insisted on photographing the handing over of the vast winnings! Flush with success we decided to call it a day……. quit while you are ahead is what I say. The girls came and collected us and it was back up to our apartment on the hill for a wonderful meal produced by Keith and Sarah. 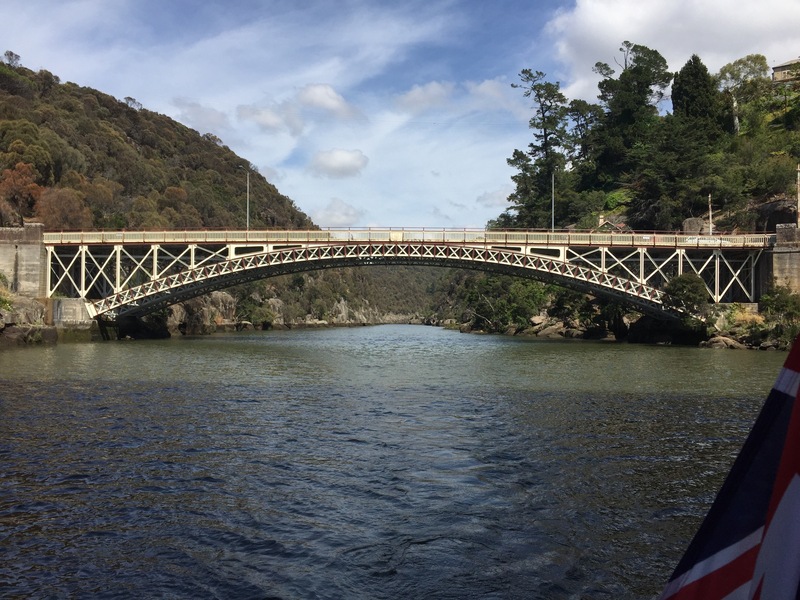 We dined royally overlooking the Tamar and drank champagne to note our visit to Launceston. The complex where Kathryn had her flat in Melbourne was based around a converted grain silo just like the one in your photo. Lots of windows and very expensive (they lived next door in a traditionally built building where the rent was much more reasonable).